In many parts of the world, the sweet spot for Passive House construction is affordable multifamily housing. This is particularly true in the northeast United States. Although Passive House construction techniques and details are becoming familiar to architects and builders, there’s always the question of cost. Can a multifamily Passive House building be constructed for the same cost as a code-built building? According to architect and Certified Passive House Consultant Michelle Apigian of ICON Architecture, the answer is a resounding Yes! It’s all about priorities, integrated design, and focus on long-term value. Concord Highlands, in Cambridge, Massachusetts, is a prime example of how this can be done. When Cambridge-based owner and developer Homeowner’s Rehab, Incorporated, first talked to ICON Architecture, the goal was to work toward attaining Passive House performance, as long as it didn’t seriously impact the budget. The project had multiple potential funding sources, and maintaining the budget was critical to nailing down the financing. As design work progressed, the team eventually realized that it could reach its goal. Success was due to a combination of a design team that had previous Passive House experience and the owner’s motivation, including a willingness to spend a bit more money in the beginning to investigate high-performance options. These early investigations led to decisions that saved money, ensuring performance and cost optimization. Construction started in May, shifting the team’s focus to ensuring execution that delivers on the design intent. To that end, on-site trainings are being conducted for both the general contractor and the strategic trades. Concord Highlands contains one floor of podium level parking and 98 one-, two-, and three-bedroom apartments on six floors. In addition to 12 apartments, the first floor contains a lobby; property management offices; and spaces for mail, for maintenance, and for residents to gather. The top floor contains shared laundry facilities, a community room, a community kitchen, and a roof deck. Current programming ideas include a roof farm on the deck, managed by an outside service. The building was designed using Active Design principles, promoting light-filled stairwells and interior common spaces that invite resident engagement. The top-floor spaces have the best views of the adjacent Fish Pond Reservoir, a green space and part of the water supply for the city of Cambridge. Homeowner’s Rehab builds projects that are community and resident oriented, with a targeted tenant mix representing various income levels. More than half the units are for families making less than 60% of the regional Adjusted Median Income (AMI). The remaining units are for families making no more than 100% of the AMI. Five percent of the units are accessible; 2% are for hearing-impaired residents. The project is located in an evolving industrial area, sandwiched between a high-density residential neighborhood of single-family homes and a retail-oriented zone. There is walking access to food shopping and other amenities. There are 67 parking spaces (a 68% ratio) and 103 resident bicycle parking spaces (100%+). The location is closely connected to Cambridge’s extensive bicycle network; it is 1 mile from the closest subway station and adjacent to bus stops. One way to keep costs under control is to design using familiar assemblies. The building has two levels of concrete deck construction. 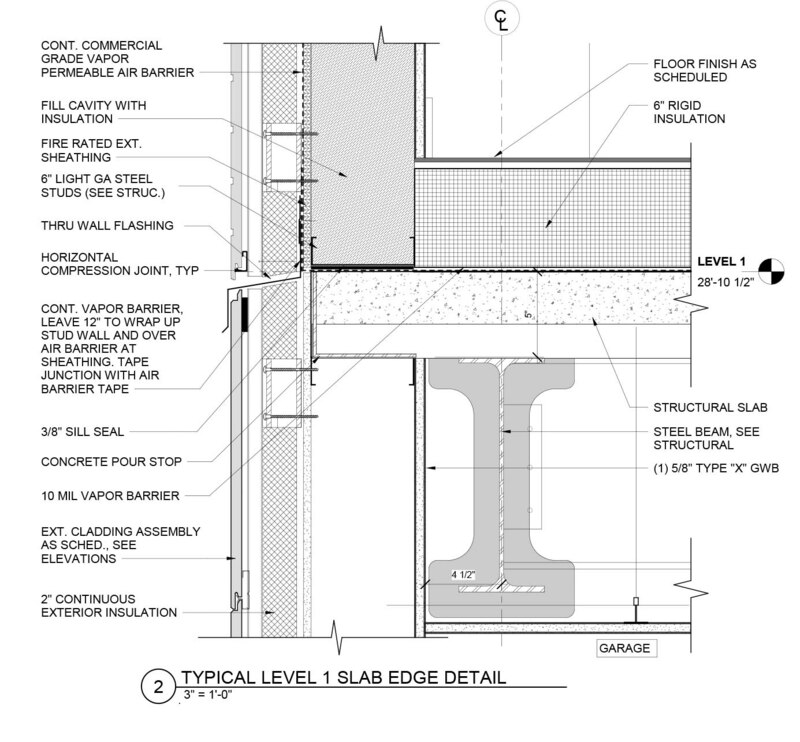 The lower floor above-grade walls are 2 x 6 metal studs. The upper-floor walls are fire-treated 2 x 6 lumber. All exterior walls are being filled with blown-in fiberglass and wrapped in 2 inches of mineral wool over a combined air and water barrier applied to the sheathing. The cladding is being attached using fiberglass clips to minimize thermal bridging. The roof is a 20-inch truss cavity, also filled with fiberglass, and covered with a minimum of 2 inches of sloped rigid insulation. Due to significant ventilation requirements, the laundry room is outside the conditioned space. The trash rooms and the management offices are also outside the Passive House space. Concord Highlands is not actively pursuing Passive house certification, but it is adhering to Passive House design principles. WUFI modeling was done early on. It showed that, counter to the design team’s intuition, overheating would not be a problem if the team eliminated shading on the building’s east-west axis—a significant savings. The team also did thermal bridge calculations to make sure there were no significant problem areas. The one significant bridge, at the intersection of steel columns and beams at the podium level, was eliminated with a structural thermal break material. Cambridge typically requires LEED certification, but the project was granted a variance to pursue Enterprise Green certification instead, because of its focus on affordable multifamily projects. As part of that effort, there is a dedicated sustainability consultant on the project, and there will be extensive commissioning, including infiltration and ventilation. Thanks to all these efforts, the residents will be enjoying low utilities, great air quality, comfort, light-filled public spaces, and ready access to the vibrant Cambridge community.